September 29th is a powerful day in honor of Archangel Michael and the mighty Archangels. Arc Archangel Michael is considered the greatest of all angels in the Jewish, Christian and Islamic religions. 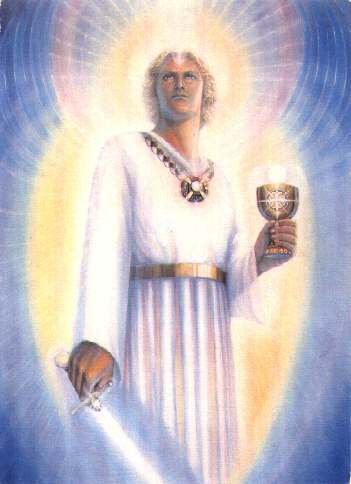 He is known as Holder of the Keys of Heaven, Chief of the Archangels, and Angelic Prince of Israel. He is Commander-in-Chief of the Heavenly armies, and fights for justice. Lord Michael is associated with the element of fire, which symbolizes the burning away of negativity. Michael is the warrior whose light is triumphant over darkness. Often he is depicted with a sword of blue Light that he uses to cut away whatever it may be that is holding us back from our life's purpose. He can help us face those aspects of ourselves that we have ignored or pretended didn't exist. He is the bringer of patience and happiness. In the Edgar Cayce readings, a question was asked, "What is the relationship between Michael, the lord of the Way, and the Christ Way?" "Michael is the archangel that stands before the Throne of the Father. The Christ is the Son, the Way to the Father, and one that came into the earth as a man, the Son of man, that man might have the access to the Father; hence the Way. Michael is the lord or the guard of the change that comes in every soul that seeks the Way..."
When my spiritual journey began in my late thirties, Archangel Michael helped me face my shadow. Within a short time, my life completely changed direction in an amazing way. I'm so grateful for the assistance of the angels. We are so blessed to have Mighty Heavenly help as we awaken to our divinity.